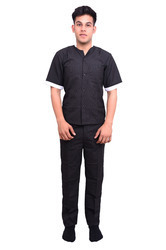 We are a leading Manufacturer of house keeping uniform, housekeeping dress, chef coat, crepe saree and front desk uniform from New Delhi, India. 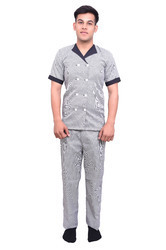 Following the quality parameters, we offer an extensive range of Housekeeping Dress. This Housekeeping Dress is used in various textiles and garments industries for their high grade quality. We offer comfortable to wear and perfect fitting Solid chef Uniform to our clients. Moreover, customers can available various sizes if Solid suit from us. Following the quality parameters, we offer an extensive range of Chef Coat. This Chef Coat is used in various textiles and garments industries for their high grade quality. We offer comfortable to wear and perfect fitting Solid chef Uniform to our clients. Moreover, customers can available various sizes if Solid suit from us. 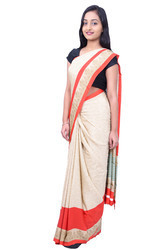 We offer a wide Crepe sarees. This entire range is made of premium quality fabric, which makes it comfortable to wear and the material is not slippery and comfort to use. Further, our range is available in various elegant designs that suits every woman’s personality. Following the quality parameters, we offer an extensive range of Front Desk Uniform. This Front Desk Uniform is used in various textiles and garments industries for their high grade quality. 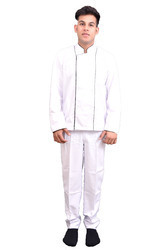 We offer comfortable to wear and perfect fitting Solid chef Uniform to our clients. 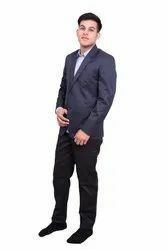 Moreover, customers can available various sizes if Solid suit from us.